This condo complex is your one-stop ocean getaway destination. 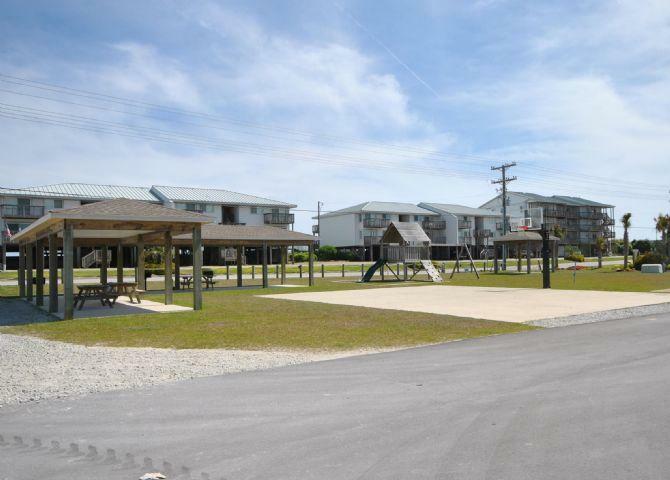 All guests of B-106 can enjoy the oceanfront proximity of the condo with DIRECT beach access, use of the clubhouse featuring a fireplace, kitchenette, lounge area, pool, locker rooms, hot tub, boat launch/storage, docks and community-wide wireless internet. 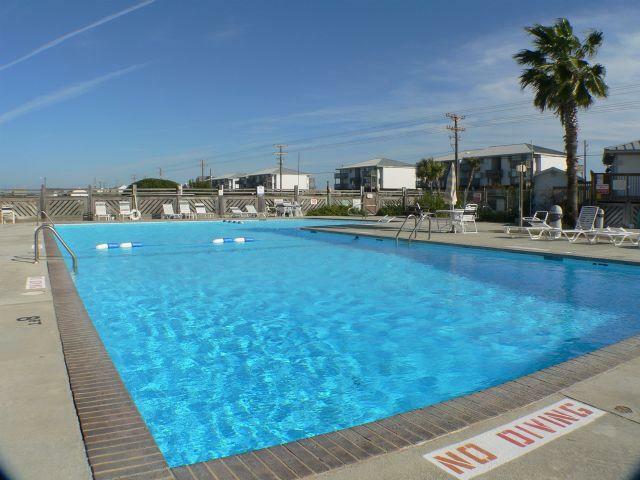 This unit B106 is located on the first floor and offers direct access to the beach from the unit. Entering the unit there is a laundry room directly on your right. Turning down the hallway into the open floor plan living area you will find a fully equipped kitchen with bar seating on your left. A large pub height dining table for four in centered in the middle of the large room. Ahead is the living room with stunning ocean views, flat screen TV and sliding glass doors onto the large beach front deck. This room also has a queen sleeper sofa for additional sleeping accommodations. To the right of the living area is a hallway to the units' two bedrooms. To the left is the master bedroom. This bedroom has a King sized bed, TV, private bathroom and sliding glass door out to the ocean front deck. Down the hallway is the second bedroom and bathroom. The bathroom is located in between the two bedrooms. The second bedroom located on the sound side of the unit and has two twin beds and a sliding glass door out to the private sound view deck. On the ocean front deck, you will find ample tables and chairs for sun bathing or just enjoying the view. 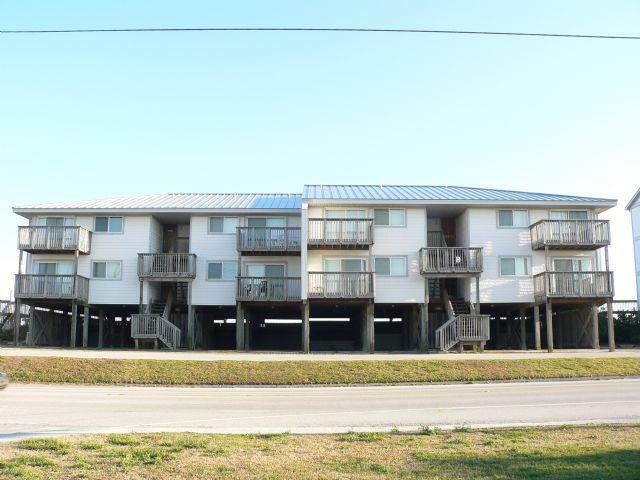 With both sound and oceanfront views, this unit is sure to please! "The location of Queens Grant B-106 is ideal. Even in the busiest season of the year, the beach is uncrowded, and we enjoyed walks to the piers every day. We played on the beach and in the waves daily and spent one morning jet skiing. The pool was a little crowded, and its location across the beach isn't ideal, but the beachfront condo more than made up for it. We really like the relative quiet of Topsail. The condo itself was clean and well-stocked. We liked our rental linens as well. The only complaint we have is that the WiFi was so weak as to be unusable, which was problematic. We looked for a rental with WiFi since we were in online courses. The unit really should not advertise WiFi. Still, it was a great beach vacation, and especially when we don't need WiFi, we'd stay here again!" The location of the Access Realty property we rented, Queens Grant B-106, is ideal. 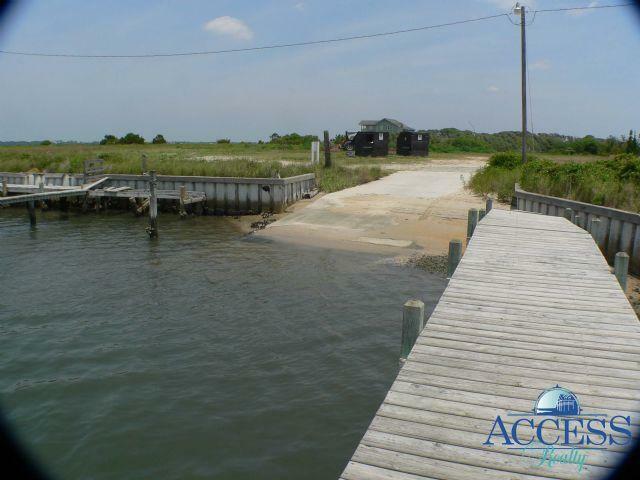 "The location of the Access Realty property we rented, Queens Grant B-106, is ideal. Even in the busiest season of the year, the beach is uncrowded, and we enjoyed walks to the piers every day. We played on the beach and in the waves daily and spent one morning jet skiing. The pool was a little crowded, and its location across the beach isn't ideal, but the beachfront condo more than made up for it. We really like the relative quiet of Topsail. The condo itself was clean and well-stocked. We liked our rental linens as well. The only complaint we have is that the WiFi was so weak as to be unusable, which was problematic. We looked for a rental with WiFi since we were in online courses. The unit really should not advertise WiFi. Still, it was a great beach vacation, and especially when we don't need WiFi, we'd stay here again! Our experience with Access Realty was terrific. They are efficient, competent, and friendly. We would definitely rent with them again."